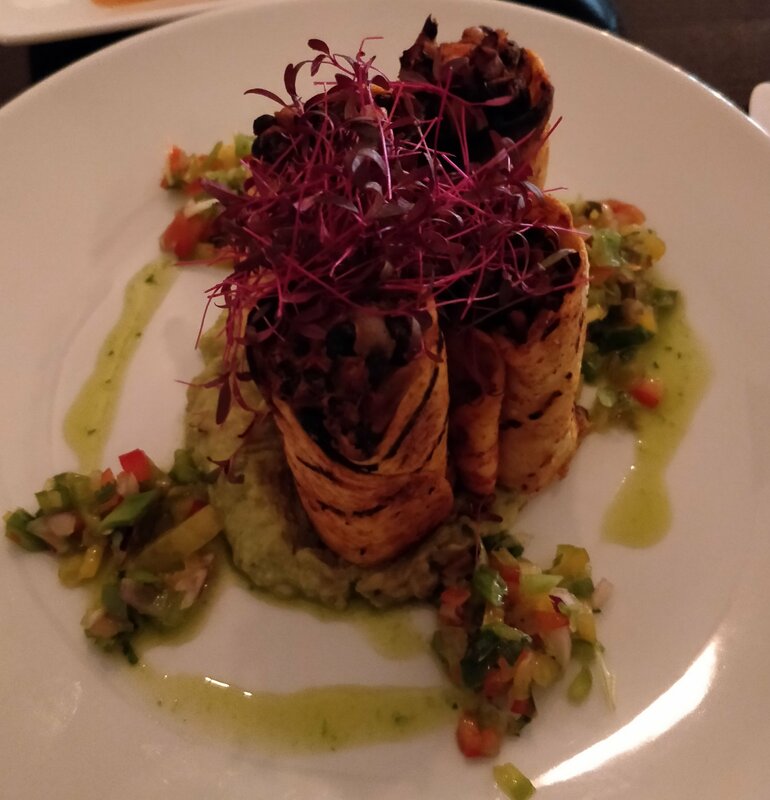 The Blacksmith and The Toffeemaker in Islington recently went vegan so my monthly dinner companion Jo and I thought we’d take advantage of their January deal of 241 mains if you bring something for the food bank. They serve a mixture of burgers and toasties with chips or salad. We both liked the look of the chorizo one which came with jalapeñoes, refried beans and cheese. The jalepañoes were a bit too spicy for me so I picked them out but overall it was a great toastie and I definitely want to return to try some of their other options. I went for fries with mine while Jo went for the healthier salad option. Jo said she thought her salad might be a bit more interesting than just leaves in a vegan place but sadly not. The service was prompt was we done in 45 minutes but not ready to head home at 18.15 (!) so I did a little search for cocktails nearby and we ended up in The Ladybird Bar, they had a happy hour offer of 241 cocktails on those marked on the menu with a ladybird so we both went for a twist on a piña colada and enjoyed it thoroughly. So with all our offers we had a lovely meal and a cocktail for £11.50 each! Not bad for a Tuesday night! Have you been to either of these places before? What did you think? Where else should we try out in Islington? Let me know in the comments below. My Mum and I were hoping to go to the newly vegan Blacksmith and Toffeemaker after our trip to see Sir Matthew Bourne’s amazing Cinderella at Sadlers Wells in Islington but unfortunately they aren’t open on Sundays so we headed back to old faithful The Gate. 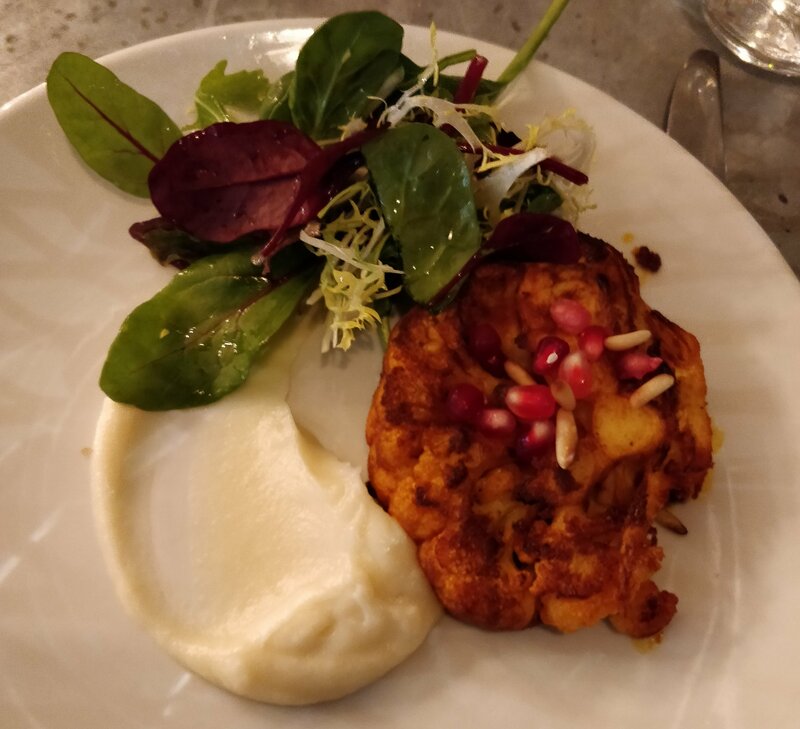 I cannot count the number of times I have been to this veggie restaurant or its sister branch in Hammersmith (I haven’t quite made it to the Marylebone one yet, although rumour has it one of my vegan contacts is now a chef there). 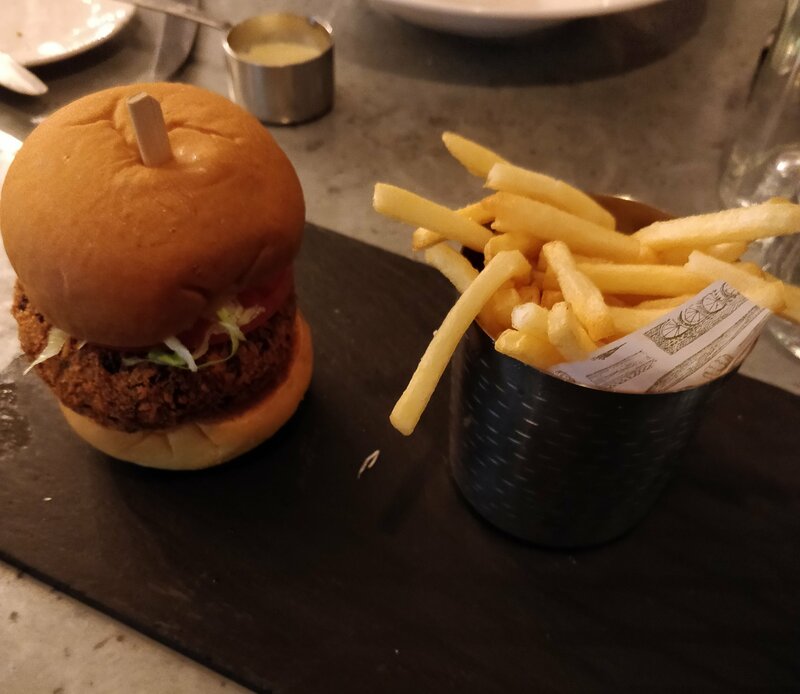 I’m not sure if it was because of Veganuary or just the way things are going but there were definitely more vegan options on the menu than I have seen in the past. I think all but one of the mains was vegan. I decided for tortillas filled with black beans and sweet potatoes and a side of crispy polenta chips while Mum went for the aubergine schnitzel with a side of cauliflower in tahini sauce with pinenuts and pomegranate. My tortillas looked a bit more special than your usual Mexican fayre and they were tasty and crispy to boot. I couldn’t really taste much sweet potatoes over the various spices but I wasn’t missing anything. 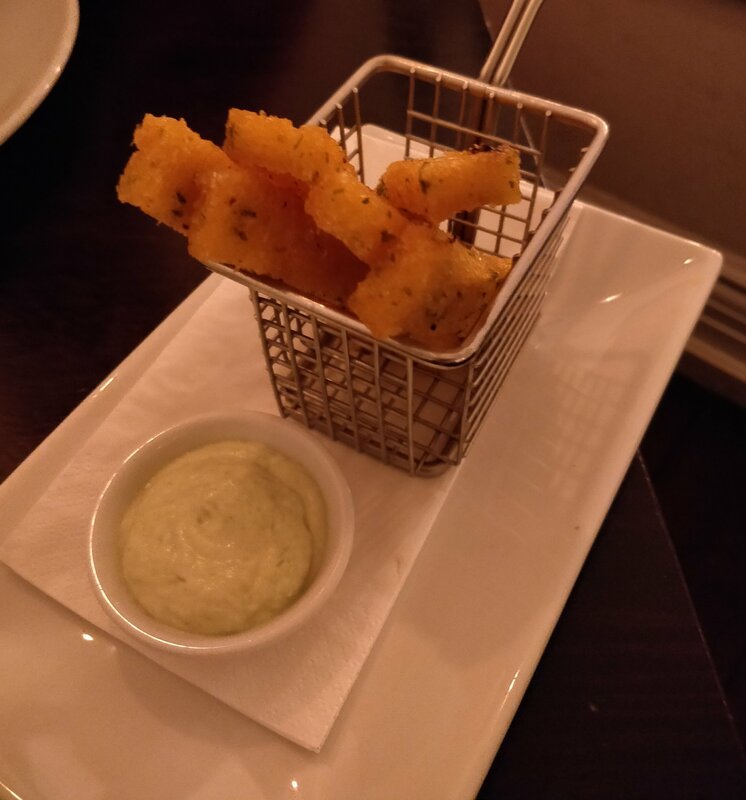 The polenta chips were really crispy and I’m glad they’ve taken off the cheese and made the aioli vegan so this is a vegan dish from the start! My Mum said her schnitzel wasn’t as crispy as she would have liked but really loved the cauliflower especially the sauce. 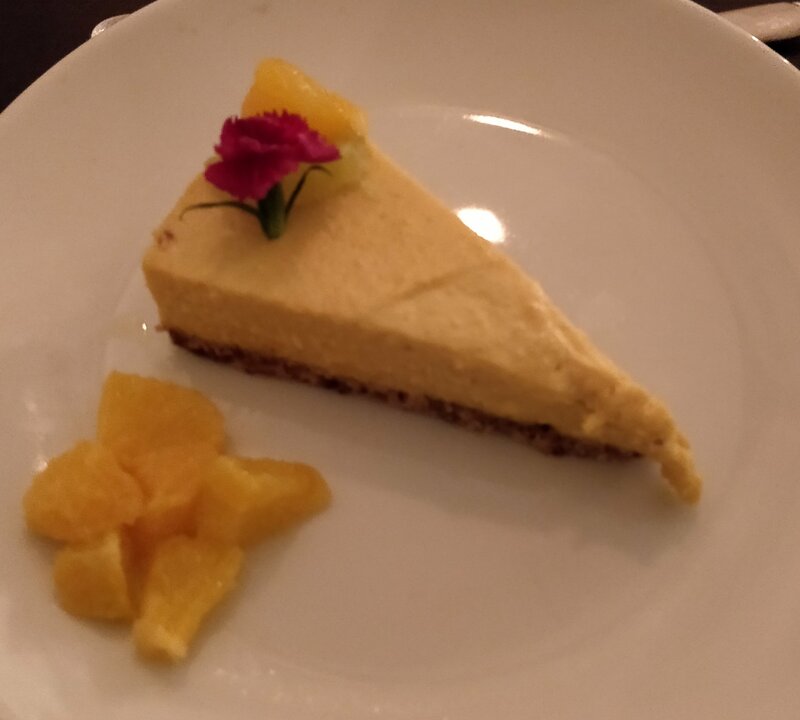 For dessert I chose the citrus tart which had an orange, lemon and lime cashew filling. This was your typical raw dessert and was lovely and zingy. 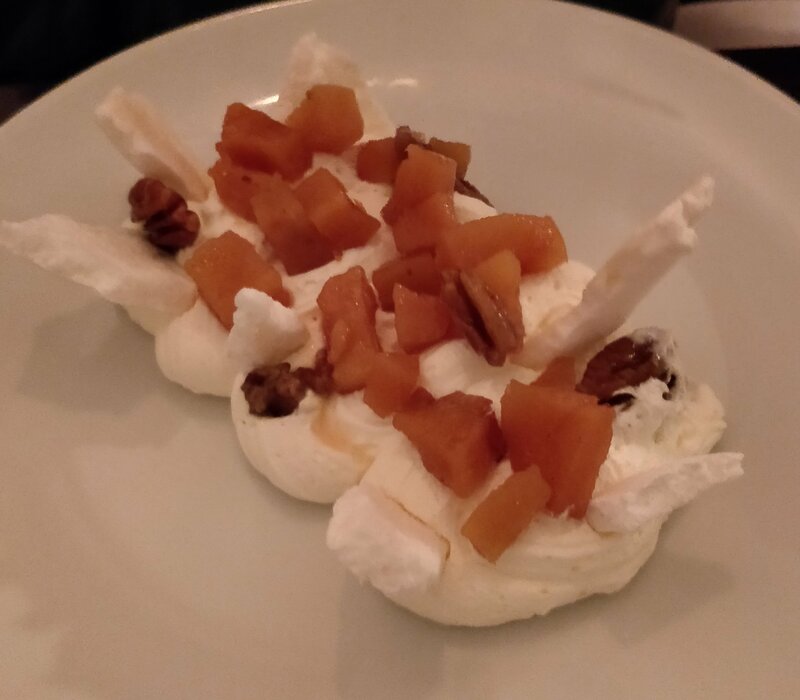 Mum went for the Eton mess with pecans and quince, this was another vegan dish so they must have made the meringues with aquafaba. This wasn’t served in a tall glass but on a plate and with the shards of meringue sticking out I thought it looked like some sort of insect! Mum said it was tasty though. All in all a fab meal after a lovely Mother/Daughter day out! Have you been to The Gate recently? What did you think? Let me know in the comments below. I wasn’t previously aware of French restaurant chain Aubaine but I saw on a post from Veganuary that they were having a vegan menu for January and as there is a branch close to my office I knew a lunch there was in order. I enlisted my friend Jo, who I usually have a monthly dinner with, but as she has now moved into my office we can extend this to lunch dates too! The vegan menu was small with two starters and desserts each and three mains, but it looked well thought out. 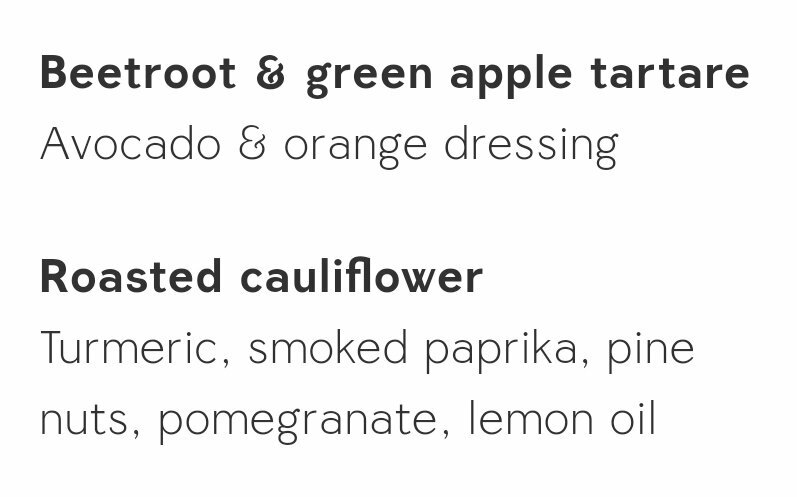 I chose the cauliflower to start which looked really pretty when it arrived. It was nicely spiced and I loved the addition of the pomegranate. The salad also had garlic oil on it which always goes down well in my books. For mains I was spoilt for choice. 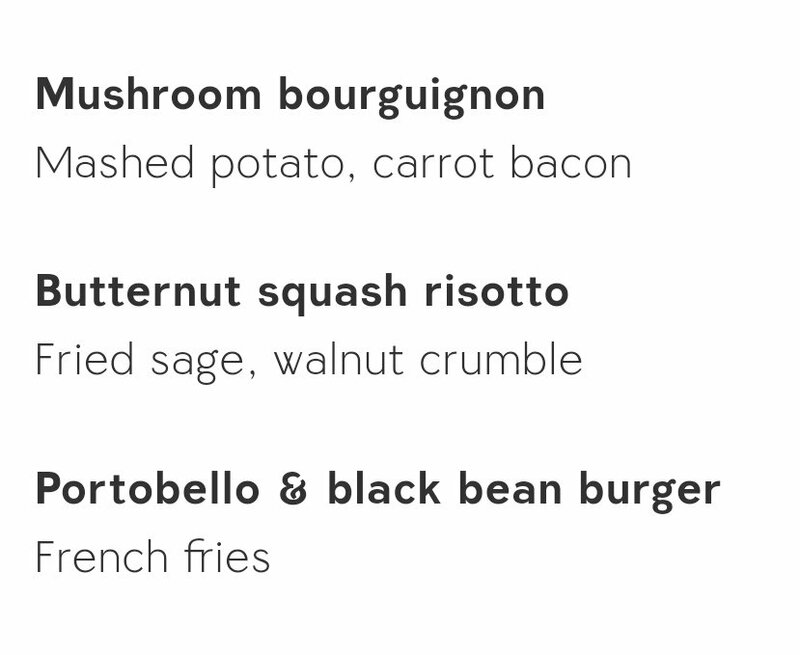 As I had had a mushroom bourguignon at the weekend I decided to go for the burger. The patty was really thick so I ended up buying round the edge first before taking a proper bug bite. It was very tasty and had a nice burger sauce too. The bun tasted sweet like a brioche which was nice as I haven’t experienced a vegan brioche bun before. Unfortunately the fries were a bit soggy so I ended up leaving half, which wasn’t too much of a hardship as I was pretty full. 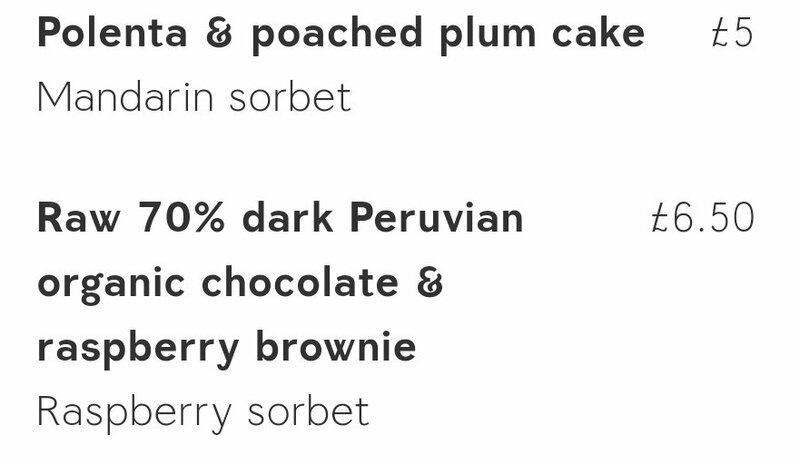 Despite this fullness I would have considered a dessert with the brownie catching my eye but as the service had been pretty slow we decided to just grab the bill. 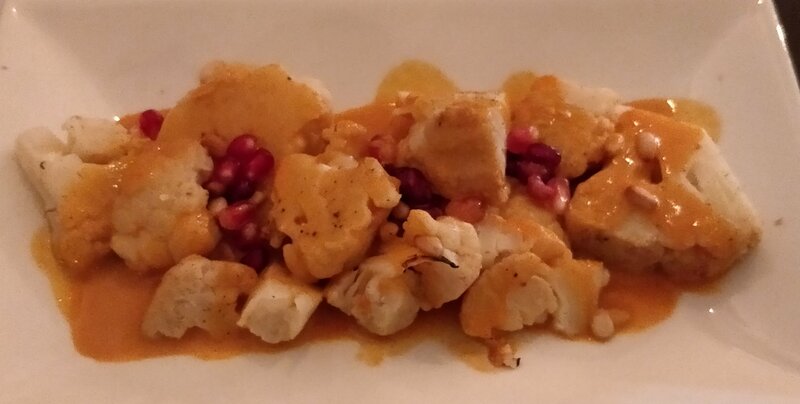 The vegan menu is a fixed price of £12.50 for two course so is really great value for money. I hope the options stay available beyond January! 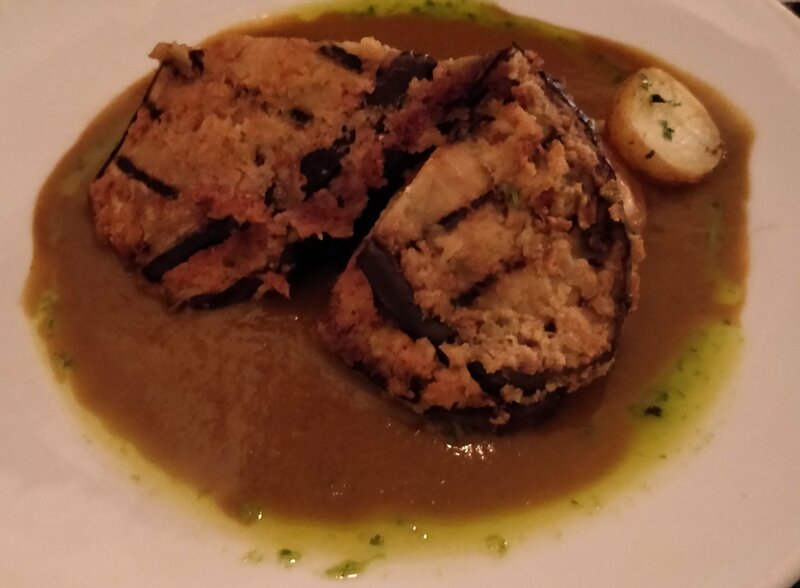 Have you eaten at Aubaine? What did you think? Let me know in the comments below. Today I met up with my friend Mitsu (of the newly revamped To Happy Vegans) for our regular lunch. We decided to branch out of our walking distance area and I jumped on the tube. Two stops and 15 minutes later I was queueing to order in Arancini Brothers. 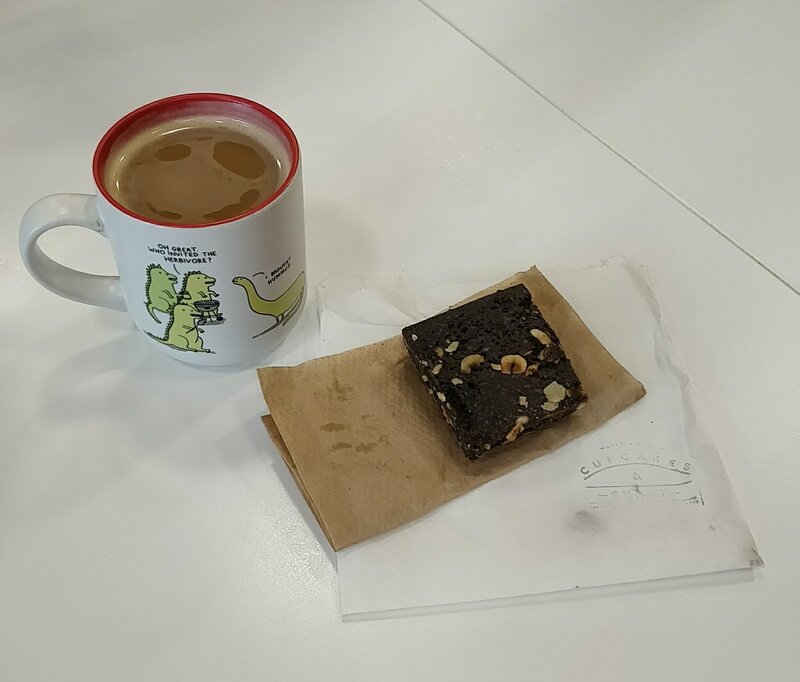 Their Old Street branch has gone vegan for January (and beyond if it proves popular) so we had to get in on the action. I went for the BBQ mushroom burger and Mitsu had the chick’n wrap. As the burger is arancini based it is a fried rice patty, it did get a little messy with both barbecue and burger sauce but I soon got to grips with it! I will definitely be returning to try some of the other items on the menu. I would have got some paprika fries to accompany my burger but I was saving room for cake! 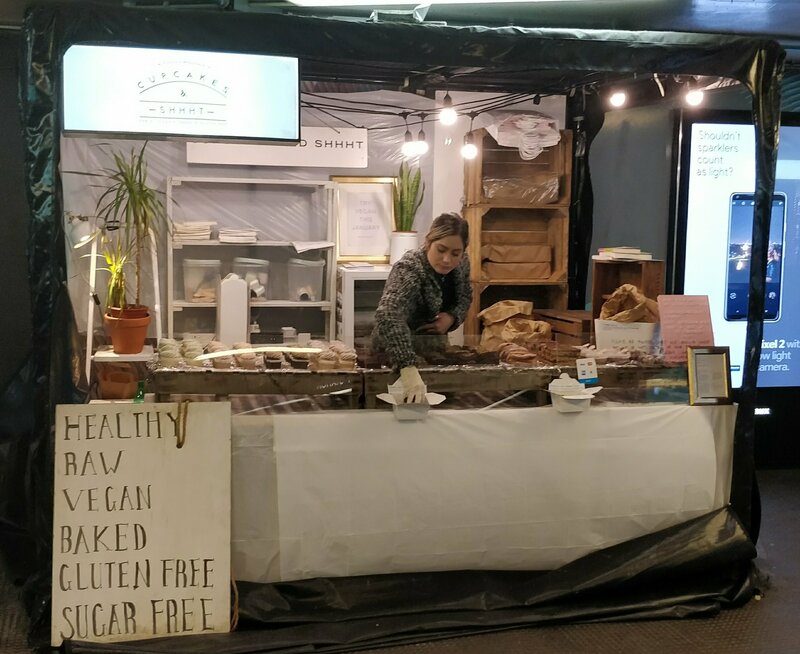 Cupcakes and Shhht are a café based in Elephant and Castle who currently have a pop-up stall inside Old Street tube station. 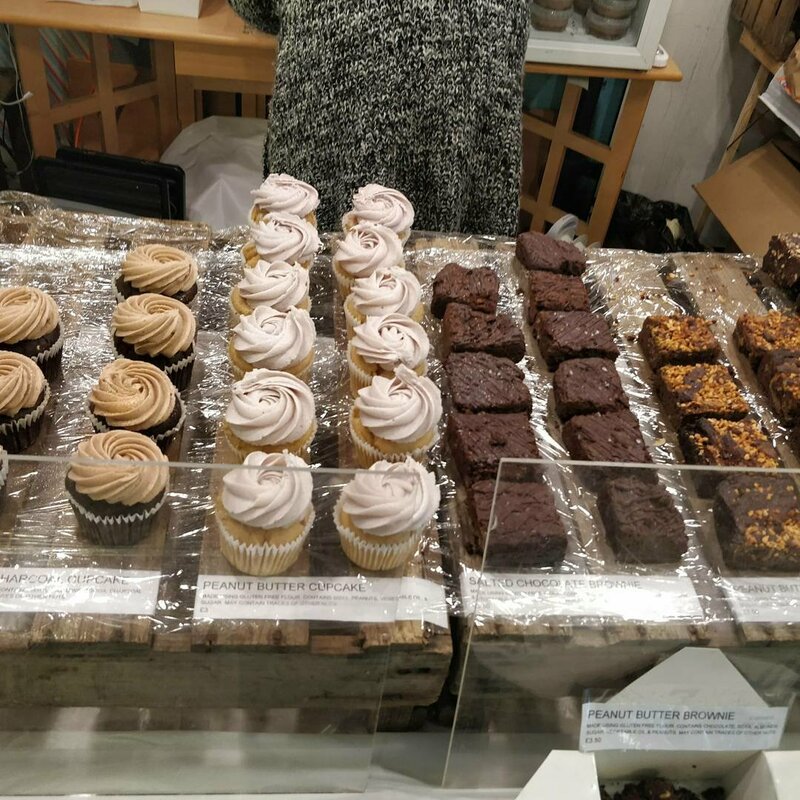 I thought a brownie was in order so I chose the hazelnut one out of the three available and Mitsu ordered a strawberry cupcake. Both places also had Instagram competitions where you could win food if you posted a picture of your grub and tagged them in it. I would be very pleased to win the 12 cupcakes on offer! If you’re in the area I would definitely recommend rocking up to both Arancini Brothers and Cupcakes and Shhht for a splendid lunch. Have you tried any of their offerings? What did you think? Let me know in the comments below. 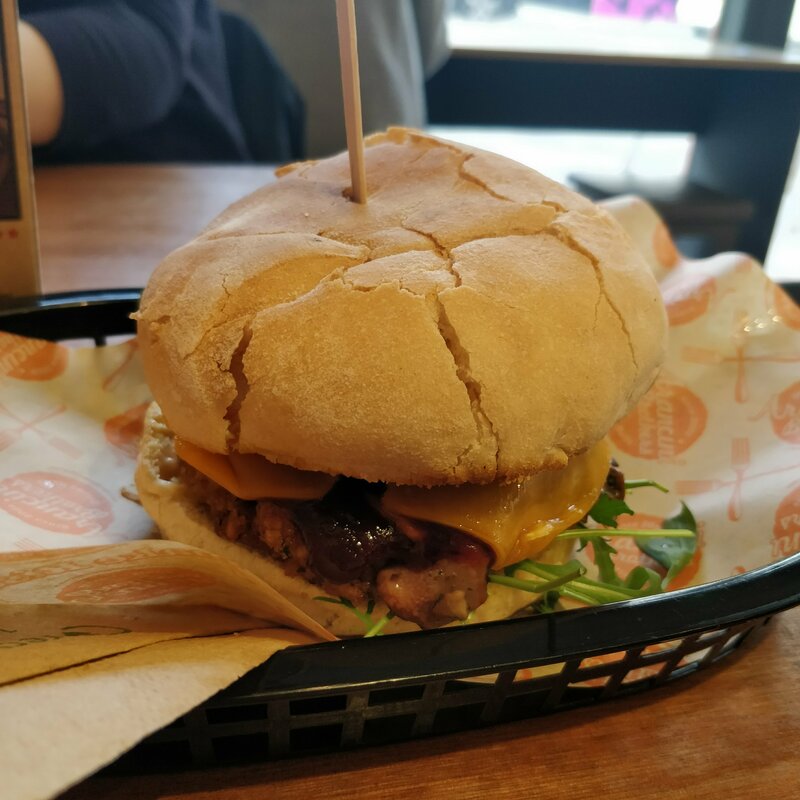 I reviewed the Mad Cucumber on the blog after a previous visit to Bournemouth here. We had a pretty late night on Saturday celebrating my friend Karen’s birthday so I wanted some serious grub before heading back to London. 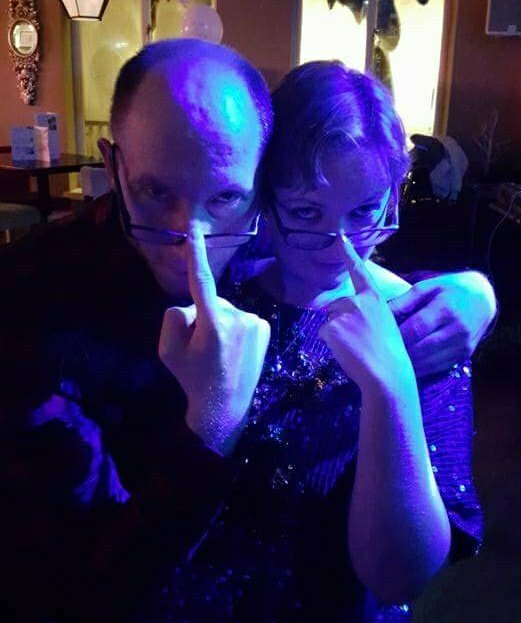 I met fellow vegan Darren on our night out and he recommended their breakfasts but unfortunately we didn’t arrive in time and missed the boat by 15 minutes. Their main menu looked equally as good so I wasn’t too disappointed. 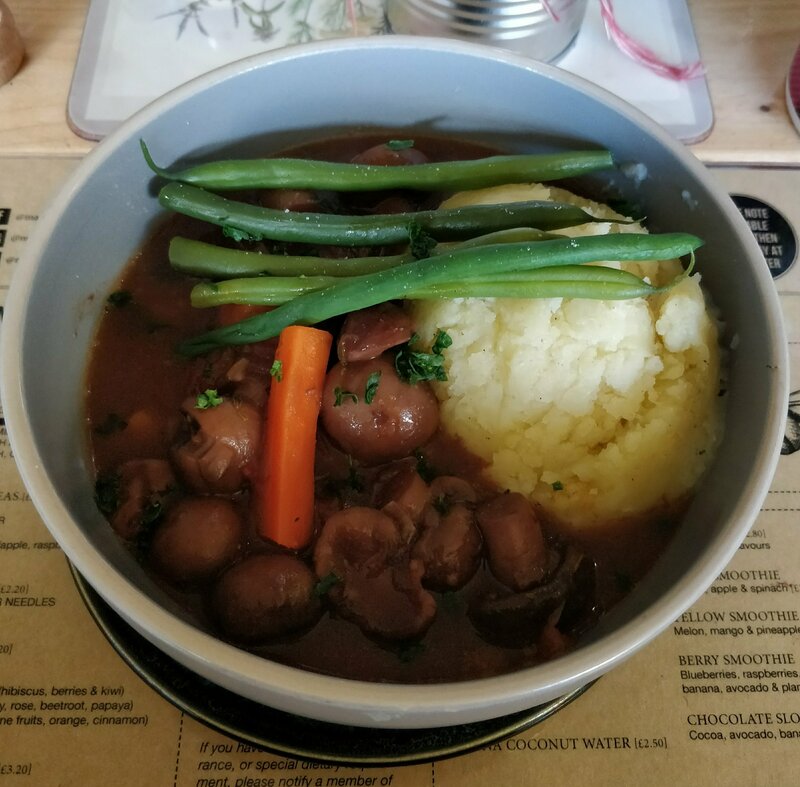 I was in the mood for mushrooms so was deciding between the stroganoff and the mushroom and chestnut bourguignon, mash won over rice so the the bourguignon it was! 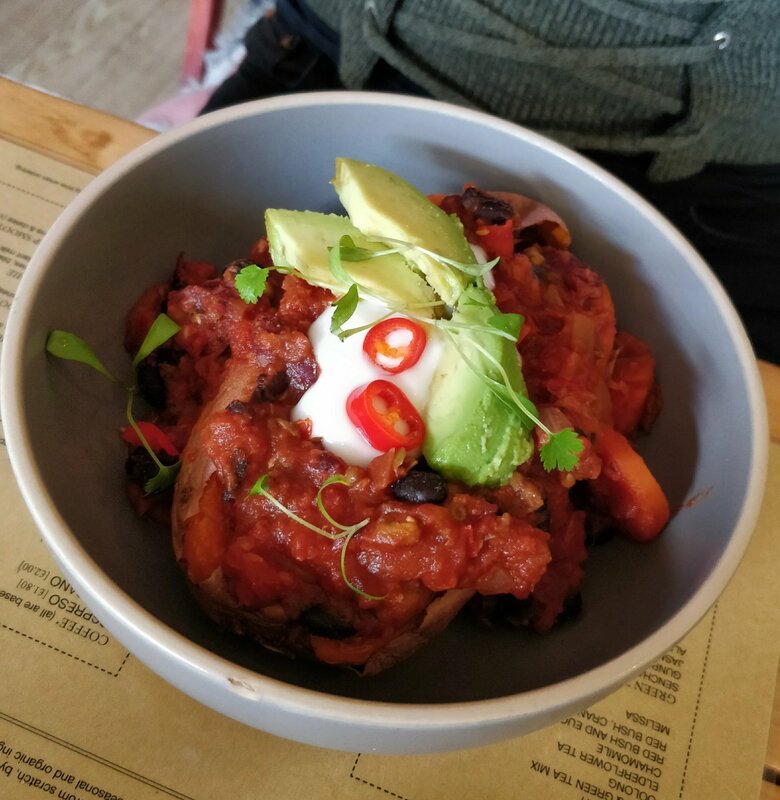 Karen decided to go for the bean chilli. Karen had a coffee to drink and I went for a silver needle jasmine tea which came with a cute little timer so I had the perfect brew! The food arrived in cute bowls and looked very hearty. This was perfect stodge food and definitely what I needed when tired on a cold winter’s day. Karen enjoyed her chilli and said it was really filling. She asked whether I was going to grab a cake for the journey home but I decided to skip it this time. Have you visited the Mad Cucumber recently? What did you think? Let me know in the comments below.